COLORADO -- The two officers accused of planning the shooting and disposal of a trophy elk on Mapleton Hill on New Year's Day are set to stand trial in October after entering not guilty pleas in Boulder District Court this morning. 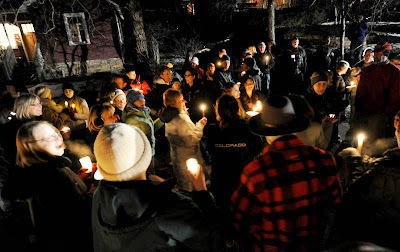 be called before Boulder District Judge Roxanne Bailin. 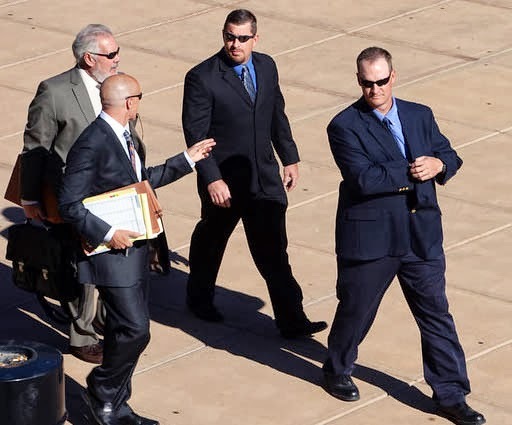 Sam Carter, 36, and Brent Curnow, 38 had both of their trials set for the week of Oct. 14 with attorneys anticipating a motion will be filed to try both of the cases as one. Attorneys for both sides said they expect the trial to take about two weeks. They are also set for a motions hearing on Sept. 4. Carter and Curnow are each charged with two counts of tampering with physical evidence, a Class 6 felony, one count of forgery, a Class 5 felony, and one count of attempting to influence a public official, a Class 4 felony. 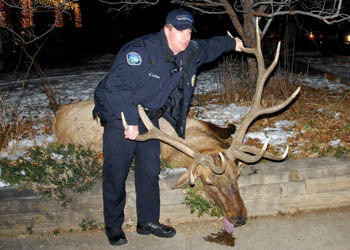 They also face misdemeanor counts of first-degree official misconduct, illegal possession of a trophy elk with a Samson Law surcharge, conspiracy to commit illegal possession of wildlife, unlawfully taking of a big game animal out of season, and unlawful use of an electronic communication device to unlawfully take wildlife. 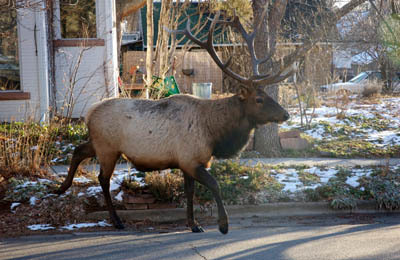 According to an arrest affidavit, Carter -- while on duty -- shot and killed the elk near Mapleton Avenue and Ninth Street on Jan. 1. Curnow -- who was scheduled to be on duty but had called in sick that day -- then arrived in his pickup truck to haul away the carcass. Shameful: When you tarnish one badge, you tarnish them all. 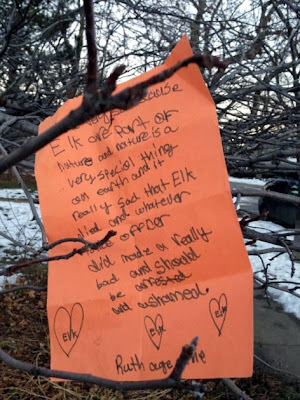 While Carter told police he shot the elk because he saw it was injured, a necropsy revealed no evidence of a prior injury to the elk, and dispatch records show Carter did not report the shooting. and should be arrested and ashamed." Carter and Curnow resigned after an internal investigation was launched by the Boulder Police Department. Both men are free on $20,000 personal recognizance bonds. PENNSYLVANIA -- An Old Forge woman credits suspended borough Police Chief Larry Semenza with saving her son from serious injury after a vicious dog attacked him Monday night. Kathy Stocki of Sussex Street said her son, Patrick, 26, was walking the family's 2-year-old Yorkshire terrier, "Squirt," near their home around 10:30 p.m. when a neighbor's pit bull charged him and their dog. 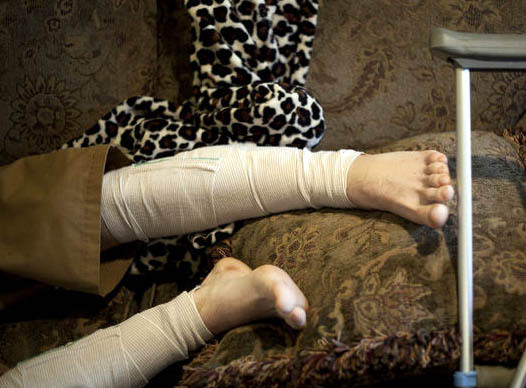 The pit bull knocked her son to the ground and bit him as he shielded his dog, she said. 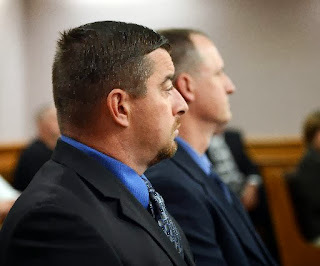 Mr. Stocki required seven stitches to close a wound to his elbow, but his injuries likely would have been much worse if not for Chief Semenza, who ran to Mr. Stocki's assistance after hearing him scream for help, she said. "Mr. Semenza came to my son's aid at his own peril," Mrs. Stocki said. Old Forge suspended Chief Semenza without pay in May 2012, when police charged him with sexually assaulting a teenage girl who was a volunteer firefighter between 2004 and 2007. He denies the allegations and awaits trial in that case. The suspended chief lives a few doors down from the Stockis. He said his wife heard the attack as she walked her dog and screamed for him to come outside. He said he heard Mr. Stocki yelling for help and found him on the ground, struggling to get up as the pit bull attacked. Chief Semenza said the pit bull bit him on the hand as he grabbed it by the neck. Though not an active police officer, Chief Semenza said he never thought twice about helping Mr. Stocki. "I've done this my whole life," he said. "Someone had to do something." Mrs. Stocki said she does not know if charges will be filed against the dog's owner, whom she does not know. She said the case is being investigated by Tina Walter, state dog warden for Lackawanna and Wyoming counties. The Taylor Police Department is also investigating the case. Taylor Police Chief Leonard Mickavicz did not return a phone message Thursday regarding why his department is investigating given the incident occurred in another municipality. Chief Semenza said he believes Taylor was asked to take the case because of the circumstances surrounding his position in Old Forge. 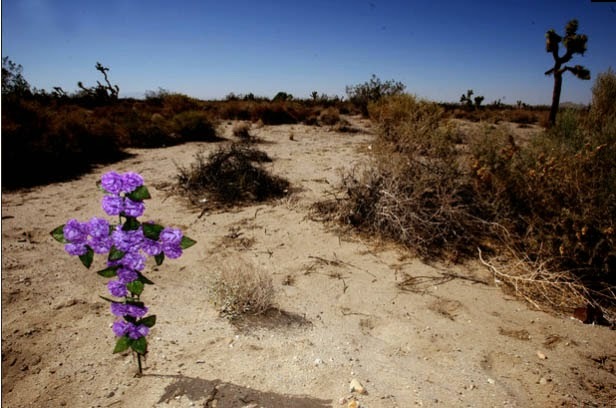 CALIFORNIA -- Residents in the Antelope Valley town of Littlerock say a fatal mauling by a pack of pit bulls earlier this month wasn’t the first time homeowners there have encountered the aggressive animals. Kimberly Eslick, 29, lives with her family near the intersection of Ave. R-8 and E. 113th St. She said they moved into the house about three years ago and said they see stray dogs all the time. Pit bulls used to sleep on their front porch and now there are dogs everywhere, she said. “There’s stray dogs running all over, all the time,” said her mother-in-law, Carolyn Eslick, 54. Kimberly Eslick said her cat was killed by one of the dogs. Once, Carolyn Eslick said, she and her husband were walking in the frontyard with their Chihuahua puppies when “one of the stray dogs came up to attack him. My husband had to throw rocks at them” to chase the dogs away. On the morning of May 9, a pack of pit bulls viciously attacked Pamela Devitt as she enjoyed her morning walk through the neighborhood. An autopsy revealed she had between 150 and 200 puncture wounds. The dogs’ owner, Alex Donald Jackson, 29, has been charged with murder and is scheduled to be arraigned Friday. He’s being held in lieu of $1,050,000 bail. When she was told what had happened, she said her first thought was “Oh my God, I let those girls walk,” referencing her kindergarten-age daughter who walks home from school with the little girls across the street. She also has a 2-year-old son. Her daughter is not allowed out front by herself anymore, Eslick said, not even to get the mail or play with neighbor girls. They bring their cats and dogs in at night. The dog problem is scary and frustrating, they said, and there doesn’t seem to be much they can do about it. Animal control officers came out once and chased some dogs around, but the women aren’t sure what came of it. That’s the approach Jane Hammer, 60, and her husband take. Hammer, 60, said she carries a handgun with a hot-pink handle. She keeps it on a lanyard around her neck every time she leaves her house. road from where Pamela Devitt was killed by a pack of dogs about a month ago. The Hammers said they have lived in the area for 25 years and often encounter “wild bands of dogs." She said the gun is for protection against those dogs, as well as rattlesnakes and anything else they might need it for. “If that woman would have been carrying a gun, it wouldn’t have happened,” Rally Hammer said. “I told her to get rid of the stick and carry a golf club. It had more swing to it,” he said. CALIFORNIA -- A pit bull owner charged with murder after four of his dogs allegedly mauled a woman in Littlerock has also been charged with assault in connection with another dog in January. Alex Jackson, 29, was arrested and charged Thursday in connection with the killing of Pamela Devitt. District attorney's spokeswoman Jane Robison said Jackson's dogs were involved in another attack on Jan. 13. In that case, his dogs attacked a horse and the horse kicked back in defense. As the incident escalated, Jackson tossed a rock at the person riding the horse, Robison said. “We believe there was evidence that he was aware the dogs were vicious and they have attacked before and he knew of the danger they posed,” Robison said. Fatal dog maulings are rare but murder charges in those cases are even rarer. Robison said the office cannot recall a similar case. 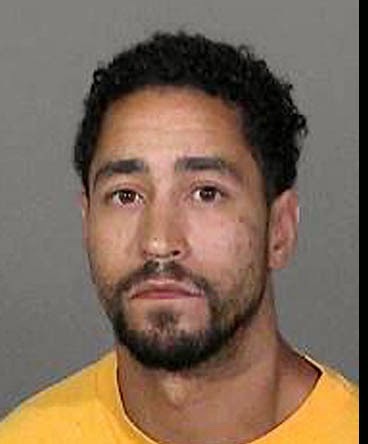 Jackson faces up to life in prison if convicted, a Los Angeles County district attorney’s spokesman said. 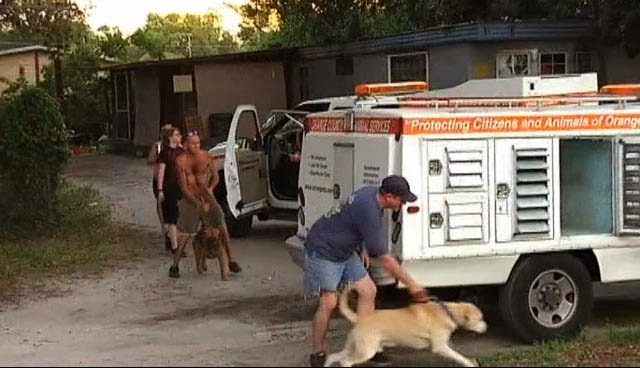 Eight dogs -- six pit bulls and two mixed breeds -- were recovered from his home, sheriff's officials said. Four of the dogs were believed to be involved in the attack. What appeared to be blood was found on their coats and muzzles. six pit bulls and two other dogs from a house on East 115th Street. In the fatal Antelope Valley case, Pamela Devitt, 63, was walking on May 9 when she was attacked by a pack of four pit bulls. A passerby spotted the attack and called police. 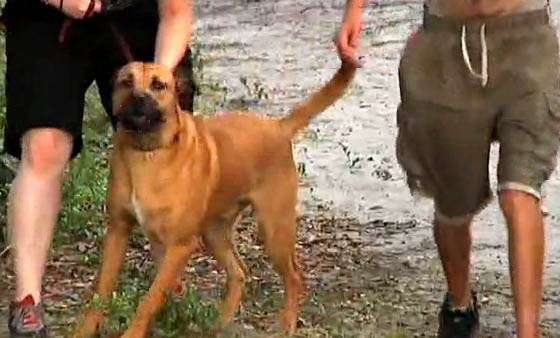 A deputy found one of the dogs still attacking the victim when he arrived on scene. Devitt died en route to the hospital as a result of blood loss. Coroner's officials said they found 150 to 200 puncture wounds and sharp force trauma across her body. 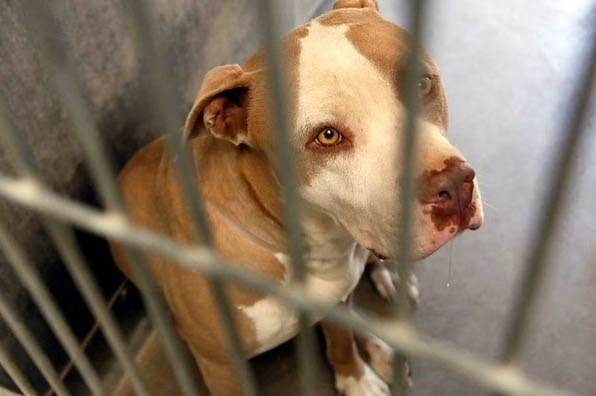 The death prompted a wide search for a pack of roving pit bulls. OHIO -- Two men have been charged in the Lima Rotary Riverwalk dog attack that occurred last month. Charges have been filed against Derek Reid and Aarion Smith, both of Lima, who had each registered a Cane Corso dog with the Allen County Dog Warden in 2012. The two dogs attacked a man on the riverwalk in April. “These were who they were licensed to in 2012, and no one else came forward,” said Julie Shellhammer, Allen County Dog Warden. Reid registered the black dog, which was fatally shot during the incident. The tan Cane Corso, belonging to Smith, remains in quarantine at the pound. There is a chance the dog may have to be put to sleep if it isn’t claimed. Thirty-year-old Dominique Badea was severely injured April 15 by two Cane Corso dogs on the Lima Rotary Riverwalk. Badea, of Lima, was injured in both legs, both arms and his face but was expected to recover. Reid and Smith face misdemeanor charges, including failure to confine and failure to register. If a citation cannot be delivered to them, they will be issued a summons, which requires a court appearance. “We’re trying to make the best determination of the legal owner,” Shellhammer said. CANADA -- An attack on a letter carrier by two loose Rottweilers led to the shooting of one of the dogs by Saskatoon police Friday afternoon, according to a witness. Around 12:15 p.m., Andrew Chamberlin was sitting in his home in the 2900 block of 20th Street West when he heard a commotion outside and went to see what was going on. Two Rottweilers, which Chamberlin recognized as belonging to his next door neighbours, were loose and running around the area. Chamberlin said he got a stick from his house and tried to shoo the dogs away, but they stayed in the area. Paramedics arrived on the scene, but were unable to reach the injured man due to the dogs. Fire crews arrived shortly after, and used sticks and a snare to try to fend the dogs off, but were unsuccessful, Chamberlin said. Police finally arrived on the scene, and one of the dogs was shot dead in the intersection of 20th Street and Vancouver Avenue South. 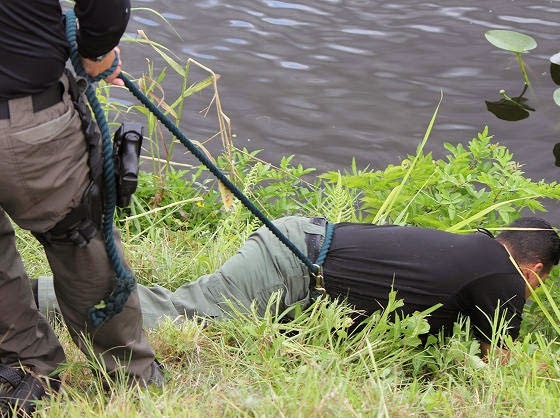 The other dog ran away, and officers took off in pursuit. After the second dog fled, a man and two women who live in the house and own the dogs arrived, according to Chamberlin. The man had a heated conversation with the officers, then got into a car and went with them to pursue the second dog. They were able to locate the second dog without incident, according to a news release by Saskatoon Police Service (SPS). The 59-year-old letter carrier was taken to St, Paul’s Hospital with non-life threatening lacerations, according to an MD Ambulance spokesperson. According to Chamberlin, the two dogs were usually not aggressive. “They were really nice dogs. My niece went to play with them before. Until they got out. Then they were all crazy,” he said. The two dogs were usually locked in the back yard, Chamberlin said, but the lock to the yard had been pulled clean off. It was unclear who had unlocked the gate. The use of force by police will be reviewed in according to police policy, according to SPS. 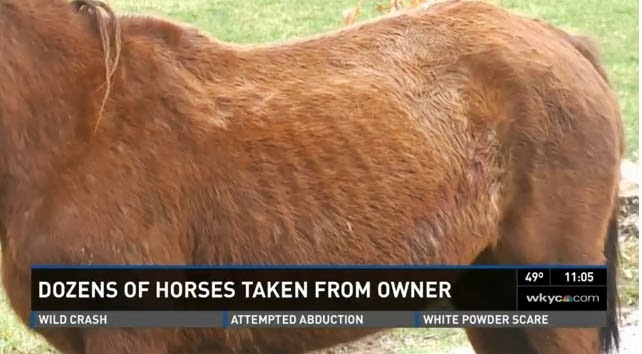 NORTH CAROLINA -- The bad economy is partly to blame for an increase in abused horses across North Carolina and the nation, a horse rescuer said Thursday. Two people face charges in Buncombe County in the case of a horse that starved to death, according to the Buncombe County Sheriff’s Office. Daryl Cody Dillingham, 22, and Connie Lynn Wheeler, 32, are charged with felony animal cruelty in the death of a paint mare in Barnardsville. Both were scheduled to appear in court Thursday. An animal control officer was called to investigate a complaint about neglect on April 18 and discovered the dead horse. Joanie Benson, executive director of the Horse Protection Society of North Carolina, said it is common to find owners giving horses away or selling them at low cost because they can no longer afford them. Benson has 45 horses on her farm in China Grove. Her operation runs on donations and volunteers. The federal government, in a 2011 study, said some states reported a 60 percent increase in horse abuse cases from 2007 to 2009. A healthy horse can cost a minimum of $300 a month and having $1,000 in reserves for vet bills is a good idea, she said. Throw in saddles, leads, food containers, horse shoeing and dental work and the cost quickly skyrockets. Benson said owners who are struggling should act quickly. “Before it gets serious at some point you have to wake up and realize you can’t afford this horse and find a home for it,” she said. In Haywood County on Thursday, Toney Martinez was scheduled for a hearing before a judge on a misdemeanor cruelty to animals charge for the death last year of a 6-year-old stallion named Bucky. He died of a massive worm infestation, said Karen Owens president of Star Ranch, a rescue operation in Waynesville. Bucky had never been treated for worms. He died with his head on a pillow and a volunteer beside him at her ranch. She was hoping for a conviction. “Something that sends a message instead of saying it doesn’t matter what you do to your horses,” she said. MICHIGAN -- A Saginaw man said he accepted an invitation to come to an old friend's house in hopes of reconciling an ongoing dispute but instead he left with life-threatening injuries after a fight involving a pit bull. Joel Cronk II, 24, said he thought his friend had called him over to "squash the problem" that had the two not speaking for the past six months, but moments after he walked through the door, the problems were amplified. said, "It's just the way they're raised." said. "I just cared about the dog bites." Cronk said his friend, a Saginaw man, was carrying a handgun. Another man was also inside the house on Mershon near Weiss in the early morning hours of Saturday, May 18. They had a drink together before the situation turned sour. The resident "wanted to fight," Cronk said. The resident held a gun to his head, Cronk said, and the three men and the resident's dog went outside, where a scuffle began. Cronk and the resident, who owns the dog, fell to the ground while fighting, and the man made a noise like "sssic," Cronk said. Within seconds, the dog's teeth were sunk into Cronk's calf, he said. The fight continued, Cronk said, and he felt fists hitting him while the dog, a pit bull-type breed, "shredded" both of his calf muscles with its jaws. "I didn't care about the punches," Cronk said, "I only cared about the dog bites because I could feel them causing damage." The dog left gashes in both of Cronk's legs and also bit his armpit and arm, which Cronk said he raised to protect his face. Once the fight was over, Cronk called 911 right away and told them he needed an ambulance. Police responded at 2:58 a.m. and temporarily detained the resident as paramedics helped Cronk into an ambulance. "I couldn't walk," he said. Doctors gave Cronk pain medication and antibiotics, and he has had two surgeries to repair the damaged muscles. Doctors told Cronk some of the tissue had to be removed and said the leg injuries were potentially life-threatening. Doctors said he should not get his legs wet during recovery and said the injuries could require amputation if they become infected. Cronk said he spends much of his free time skateboarding at skate parks in Saginaw and surrounding areas and wonders how the injury might affect him long term. Doctors told Cronk that his tendons and muscles were damaged, and he won't be able to walk without assistance for up to four months. Doctors told him he will be able to skateboard again next summer, but Cronk is not confident that his wounds will heal enough for him to reach his current skill level of jumping onto handrails and doing tricks off ramps. Cronk said he can't put pressure on his left leg, but doctors want him to move around to reduce the risk of blood clots. He does flex exercises to move his legs, which are covered in bandages that become soaked in blood and have to be changed daily. On Cronk's 25th birthday, Monday, June 3, he has an appointment with a doctor to check if his legs are healing properly. Cronk said he should know on his birthday whether or not amputation is needed. Police are investigating, and Cronk said a detective told him last week that they are attempting to secure a warrant for felonious assault because he said the resident held a gun to his head. On Friday, May 24, police said they had a suspect in the case. Police referred followup questions to the Saginaw County Prosecutor's Office, which did not immediately return a call seeking comment. Animal control officers picked up the dog, Casper, last week. The dog is now detained at the Saginaw County Animal Care Center. Cronk will attend a hearing on Wednesday, May 29, that will determine the dog's future. He said he feels the dog should be put down because it has been trained to attack. Saginaw County Animal Care Center Director Kevin Wilken siad the hearing could determine that the dog is euthanized or given back to its owner, with or without restrictions. Cronk, who said he has always been an animal lover, now has a different outlook about dogs and about people. "Don't underestimate people. Don't underestimate animals," Cronk said. The problems between the two men were over "petty things," Cronk said, and he could not identify a single issue or event that led to their falling out. "I never thought him and me would get in a fist-fight, let alone that he would talk to me with a gun in his hand," Cronk said, noting he had been friends with the resident since eighth grade. He said he doesn't want to speak with the man again, but added, "if he wants to call me to apologize, then he can give me a call." WYOMING -- A tired and cold female llama was rescued this morning from an irrigation canal north of Riverton after spending the night, and possibly longer, stranded in hip high water. 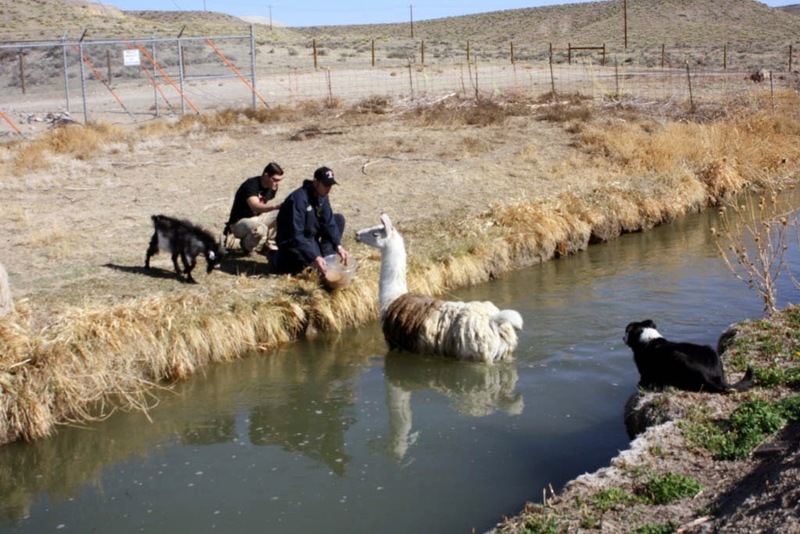 The shivering and wooly animal was rescued by Brett Ortiz, whose grandfather Red Lobdell owns the llama, and by Jim Fenton. 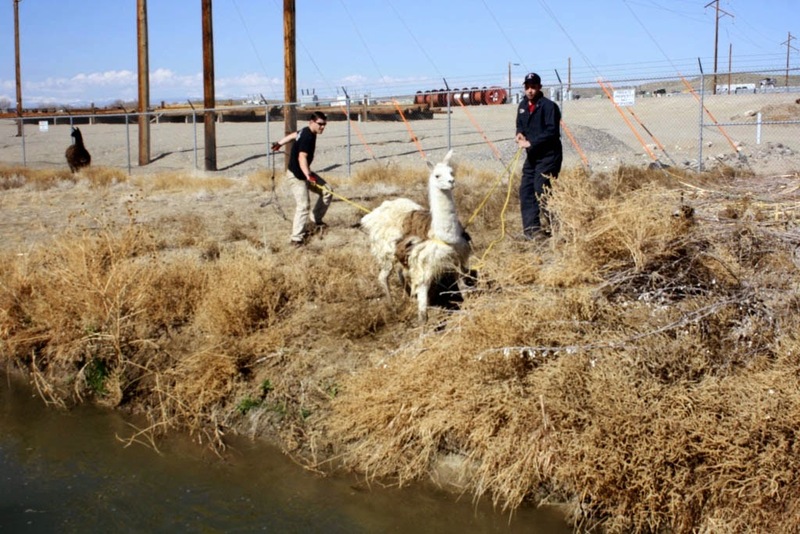 Together with with Fremont County Sheriff’s Deputy Sara Trehearne, the three managed to get a rope across the canal and direct the llama to a non-steep area of the canal. The two young men then used the rope to help pull the llama from the water and up onto the bank. “I think it’s been in there for a couple days,” Trehearne said. 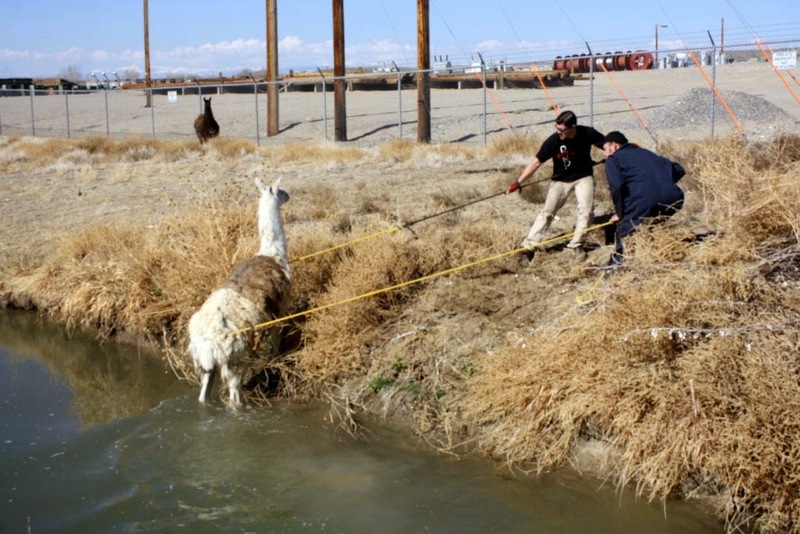 Ortiz said his grandfather had let the llamas out of their pasture and into a fenced area around the canal to graze and drink, but the female llama apparently slipped and fell in. A partner llama stood nearby watching the rescue effort. Brett and Jim coaxed the llama inside the canal to bank-side with a pail of llama chow but were unsuccessful in getting a bridle on the beast, who kept pulling away. Trehearne suggested using the rope to move the llama to where it could climb out. That technique was successful. 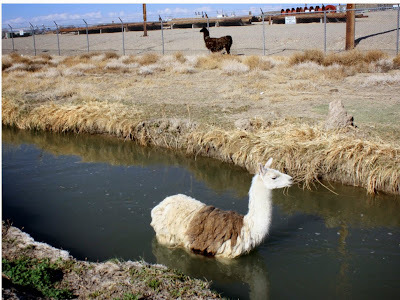 The tired and shivering llama quickly rejoined the other llama and stood warming itself in the morning sun. 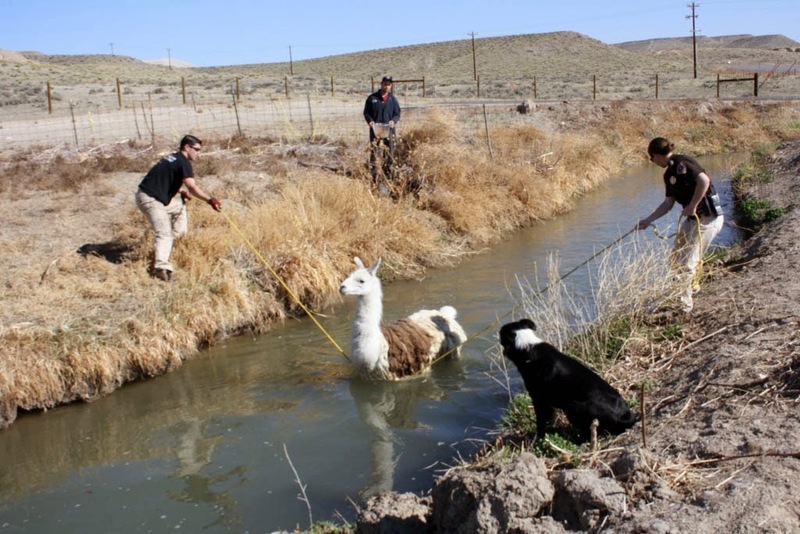 Jim Over also assisted in the rescue effort, using a long tree branch to keep the llama from moving upstream while the rope was stretched across the canal, along with Buster the dog and a goat. 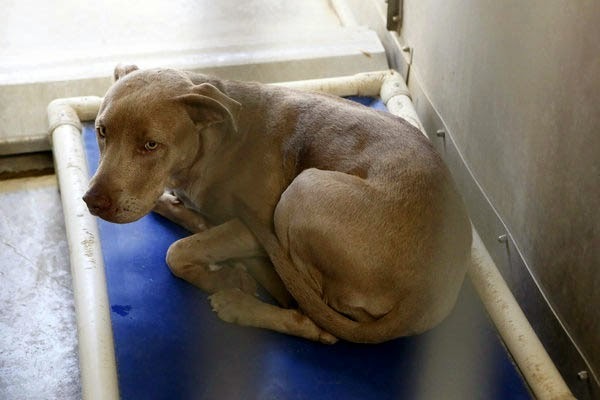 TEXAS -- A 41-year-old Spring mom　has been　charged with child abandonment after her 11-year-old son allegedly choked and drowned their neighbor’s dog. "He needs help," admitted Desiree Gillard, the boy’s mother. 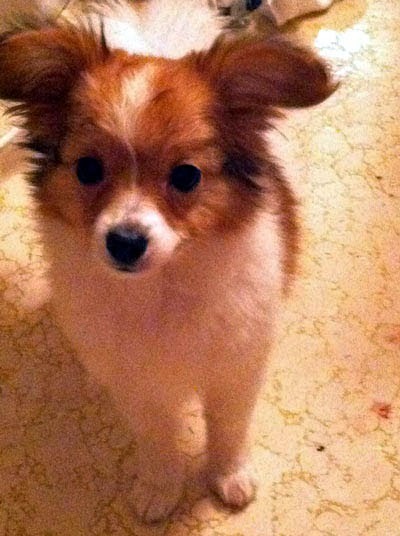 Patricia Martin noticed her little dog was missing from the yard on May 26. She checked her surveillance cameras and saw her neighbor’s son sneaking into her yard and taking her dog. She immediately called authorities. Deputies arrived to find the boy home alone. The boy said his mom had been gone since earlier that morning. When they asked him about the dog, he allegedly confessed that he stole it, choked it unconscious and drowned it in a hot tub at a nearby vacant house. "There is a hot tub there with nasty rainwater. 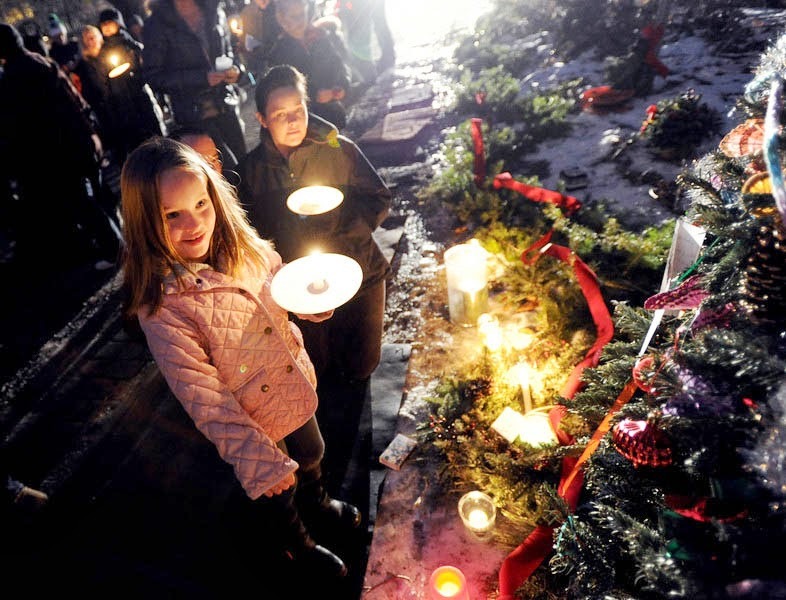 He watched it drown," said Kristin Martin, Patricia’s daughter-in-law. Patricia Martin was heartbroken. 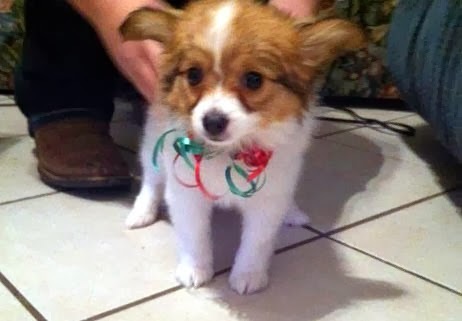 She got Sophie, a Papillon puppy, for Christmas. "She’s a sweetheart. She was very, very protective of the kids," Martin said. Deputies were waiting for Desiree Gillard when she arrived home that day, along with the boy’s father. Gillard admitted she went to Buffalo, Texas to pick up her husband after his truck broke down. Gillard initially told deputies she left her son with his older sister, but later admitted she left him alone. She said she did not have time to take him with her because she was in a hurry, according to court documents. The parents were shocked after learning what their son was accused of doing. However, the neighbor said she had heard Gillard say that her son had fantasies about killing animals. Now the boy is in juvenile custody. serial killers tortured animals as children. "It’s not normal to kill, to kill animals," Gillard said. "I miss my son. I want him home. He doesn’t belong there. He’s not a gun-toting gangbanger. He’s 11 years old." Gillard was charged with failing to provide her son with proper adult supervision in her absence. Her bail was set at $5,000. ALABAMA -- A macaw named “Pretty Bird” is on the wing off U.S. 31 in Athens, and the owner of the neotropical parrot is hoping anyone who sees the avian fugitive will give her a caw, er, call. Pretty Bird flew the coop Sunday as his owner — Nicki Parcus — was feeding him at her dog-grooming shop, Doggie Stylz, on U.S. 31 South. 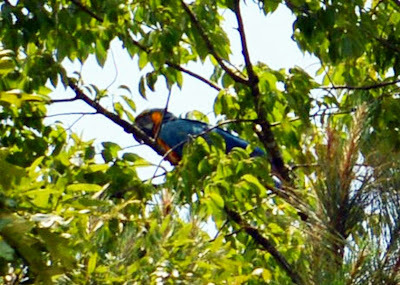 After three days of searching, the lovable, talking macaw was spotted Wednesday in a tree a few businesses north of her shop. Frantic, Parcus called everyone she could think of to prevent her beloved from becoming a victim of fowl play, including Athens Police, Athens Fire & Rescue and animal control. No one was able to help, something Parcus found difficult to swallow. Someone suggested she call a tree trimmer, and in came Tarzan. “I don’t know why the city couldn’t help her — it doesn’t seem right,” Adams said. Police Chief Floyd Johnson said the Police Department tries to search for missing pets. Fire Chief Tony Kirk also offered an explanation. He must have been reading Pretty Bird’s mind. As Adams and Parcus stepped into the dual-bucket arm of the tree-trimming truck Wednesday afternoon and ascended slowly toward the bird, Pretty Bird bolted. As birds go, a blue and gold macaw is not a difficult one to spot. Pretty Bird stands 1 1/2 feet tall and boasts a vivid blue upper body and bright yellow undercarriage. Why Pretty Bird won’t come home is a mystery. Perhaps it is the roar of U.S. 31 traffic impeding his return to the cage. Perhaps Pretty Bird— who is known to love women — is looking for a chick and hasn’t found her yet. Whatever the reason, Parcus hopes to coax him back home soon and bring this horrwrendous episode to a close. Kirk offered this advice: Bring in another macaw to call Pretty Bird. He said this approach worked in a similar case in East Limestone. If you see Pretty Bird, call Parcus at 256-374-6091. FLORIDA -- A Carrollwood area woman has been charged with one count of felony animal cruelty in connection with a case of starvation that began to make headlines last week. 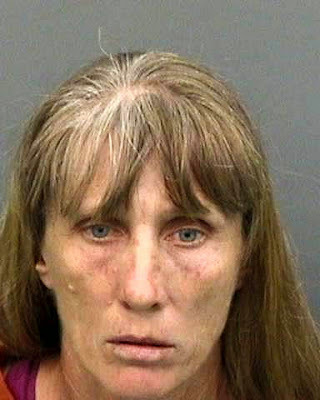 Linda Evans of 11720 Olen Smith Road turned herself into the Hillsborough County Jail May 30, according to Det. Larry McKinnon. Deputies began investigating Jolie’s case earlier this month when they were told about a horse that was being neglected. “Detectives determined that Linda Evans deprived her horse ‘Jolie’ of the proper nourishment by feeding her so little she suffered malnutrition amounting to excessive and unnecessary pain and suffering,” McKinnon wrote in an email to media. Jolie and three of her stable mates were taken to Equestrian Inc. in the Carrollwood area as the investigation continues. Evans voluntarily relinquished the other three horses, but Jolie was seized by the sheriff’s office’s agricultural unit. Smith said a veterinarian was with the horse almost constantly providing care during the last day of her life. Booking and bond information was not immediately available for Evans. 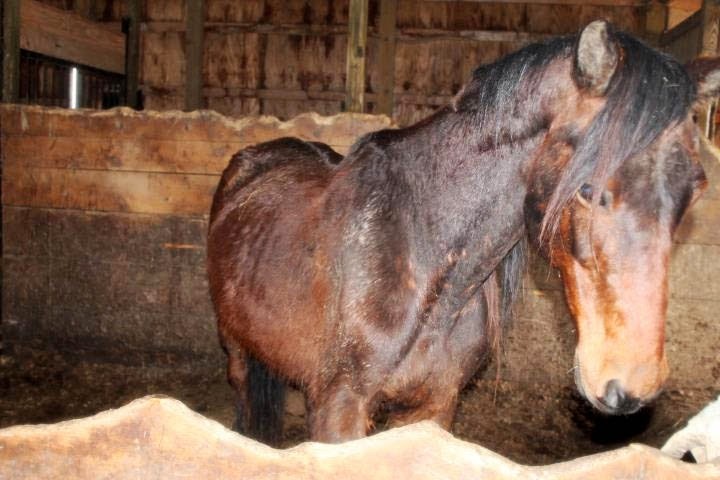 OHIO -- A Guilford Township woman who pleaded guilty to neglecting more than two dozen horses and donkeys was fined $250 and placed on five years probation Wednesday. McIlvaine suspended two 30-day jail sentences. Wilfred, 43, of 3835 Blake Road, was charged after the Medina County Society for the Prevention of Cruelty to Animals executed a search warrant April 11 at her 6.8-acre property. 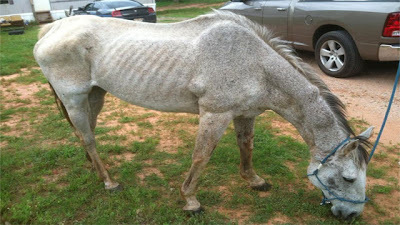 One of the 29 starving horses rescued. Animal welfare groups recommend properties should have between one and two acres per horse. Medina SPCA Executive Director Stephanie Moore said one of the horses had a fractured jaw and one was blind. Others had lice, internal parasites or blood problems. Moore said the horses and donkeys will be sold or put up for adoption. 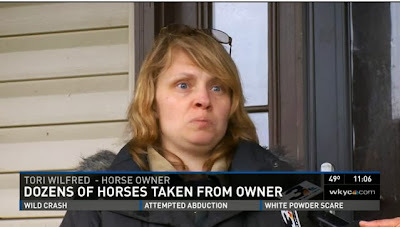 She said many of the horses already have been placed in approved homes. The search also found several cats with feline leukemia, all but one of which were euthanized, Moore said. On May 1, Wilfred entered pleas to one count of animal cruelty relating to neglect of 29 equines and one count of companion animal cruelty relating to neglect of 9 cats. She originally was charged with 11 counts of animal cruelty, but prosecutors dropped nine of the counts in exchange for her guilty plea. Wilfred was permitted to keep her remaining animals while on probation. Moore said she has about 14 dogs, four goats, two pot-bellied pigs and a cat. Wilfred must have all of them examined by a veterinarian within 30 days and provide the veterinary records to the SPCA. She also must provide information regarding the health and care of the animals and consent to random, unannounced inspections of her property to ensure compliance, according to the sentencing report. Wilfred also will be required to pay a probation fee of $15 per month. 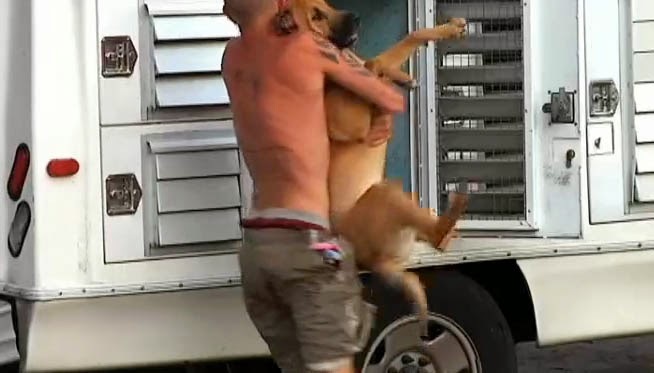 Owner: "People are going to watch this and say I'm a horrible person"
AUSTRALIA -- A Currumbin woman has told how she fought to protect herself and for the life of her dog when they were savagely attacked by two unrestrained staffordshire bull terriers just metres from her home. 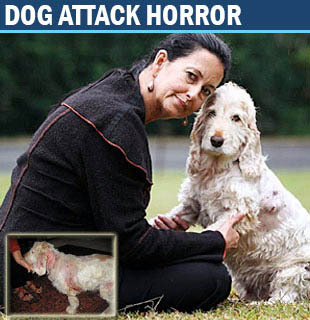 Michelle van der Walt said her hand was mauled as she fought like "a mad woman" to rescue her cocker spaniel Coco, which barely survived the ordeal on Monday last week. But despite the terrifying experience, the city council has refused to remove the offending animals, telling Ms van der Walt it was not considered a "serious enough" offence. treatment (inset). Main pic: Brendan Radke. Ms van der Walt said the council needed to enforce harsher penalties on owners who failed to restrain savage dogs. She said the council officer who interviewed her said the dogs would only be destroyed if they caused a human serious injury, or killed another animal. "My dog received 30 puncture wounds and if one of those bites had gone an eighth of an inch further, she would be dead. "I fought like crazy to save Coco and if it weren't for a neighbour who came to our aid, I know my injuries would have been a lot worse ... But council said there was nothing they could do and returned the dogs to the owner ... despite repairs to his fence still being incomplete." A council spokeswoman said both dogs were impounded after the incident and the owner was required to pay to register both dogs, which were unregistered, and all impoundment fees. She said the owner may be subject to more fines after an investigation into the incident was finished. 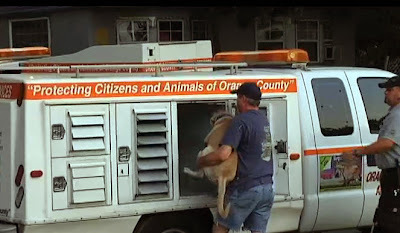 "First response is to send animal management officers to the location of an incident, impound alleged offending dogs, speak to complainant, dog owner and any witnesses, this will then be assessed and investigated," she said. "This particular incident occurred on May 20 and was responded to. The dogs in question were allowed to return home after it was established the enclosure was adequate to contain the dogs." There are 60,000 registered dogs on the Coast and the council receives an average of 400 complaints about attacks annually. Dog owners risk a $75 on-the-spot fine if their dog is not contained in a yard, or is unrestrained when on a walk. OKLAHOMA -- An eyewitness flagged down an Oklahoma County deputy after seeing two horses that appeared to be malnourished. 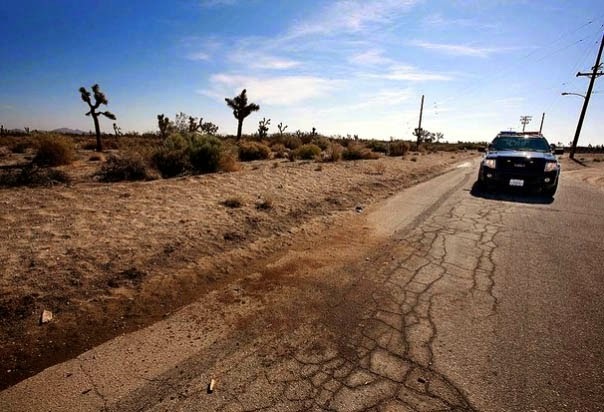 The deputy was driving near N.E. 150th Street and N. Harrah Road in Luther when the witness approached him. The deputy first spoke to the owner of the animals then took a closer look at the horses. The animals appeared emaciated. 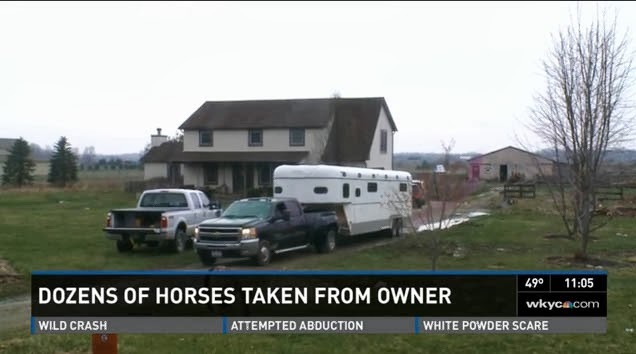 The deputy obtained a warrant and the horses were removed from the property. The non-profit group Blaze's Tribute Equine Rescue Inc. is caring for the animals. The Oklahoma County Sheriff's Office is still investigating the case. A court hearing is scheduled to determine if the owner will lose his rights to the horses. 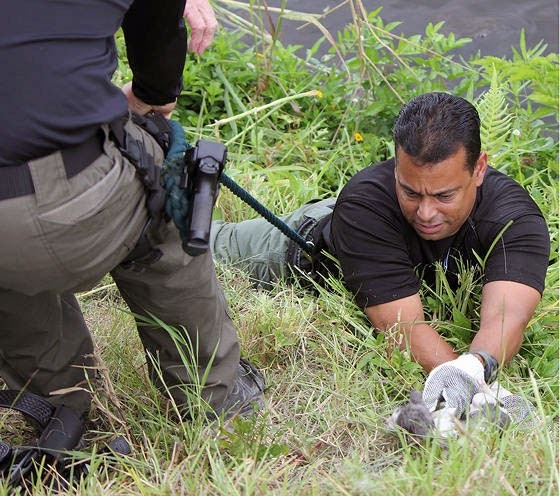 FLORIDA -- Three deputies from Hendry County Sheriff’s Office in LaBelle, Florida rescued a tiny kitten that fell into the Caloosahatchee river. They worked together as a team to get the little feline out to safety. “Yesterday while walking about town after as I was going under the LaBelle bridge, I heard a cat meow from what sounded like the center of the river. I ran over to see if I could see it and it swam around the pylons used to guide boats to the center of the bridge. "It was a kitten and seemed to be very confused, it keep swimming in circles out in the deeper water, finally after calling it, it came over to the bank but couldn’t get out. 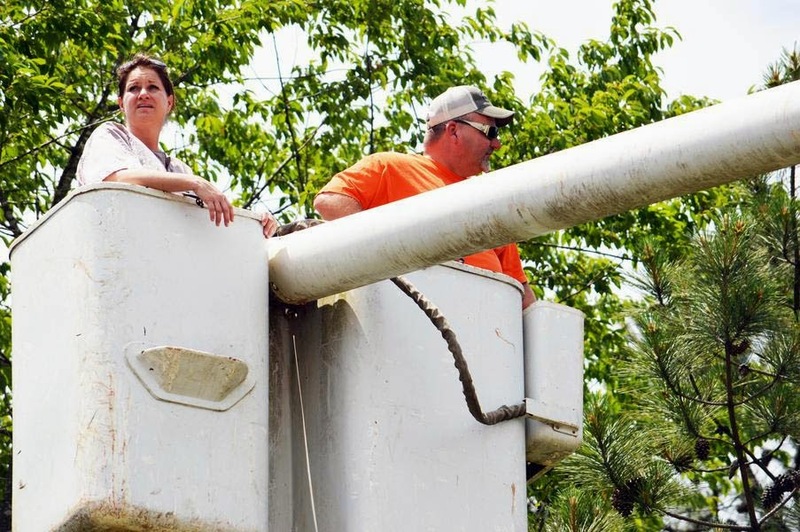 "As luck would have some of Hendry County’s finest were at a substation nearby and were more than happy to help,” said Dale Conyers. 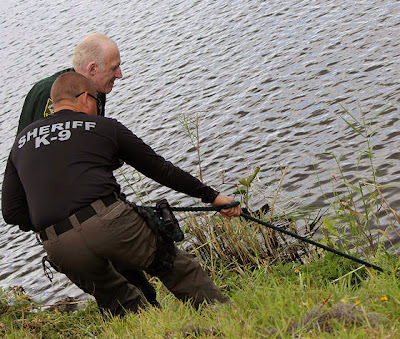 In order to save the little guy, Deputies D.J. Lansaw and David White held onto Deputy Daniel Cruz on a rope as he slowly leaned over the bank of the Caloosahatchee. 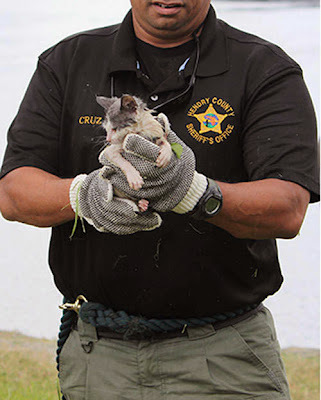 The kitten was soaked, so they had the little guy wrapped up in a warm towel and taken to get help. 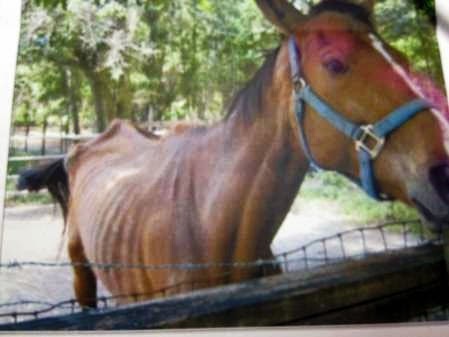 FLORIDA -- A Tampa woman is facing an animal cruelty charge after a horse was found suffering from malnutrition, the Hillsborough County Sheriff’s Office stated in a news release. 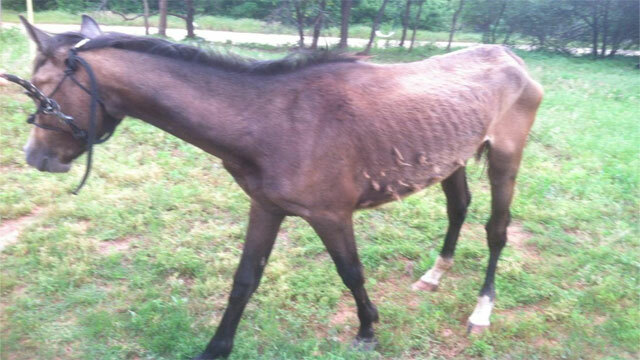 In May, deputies were notified of an abused horse at 11720 Olen Smith Road. 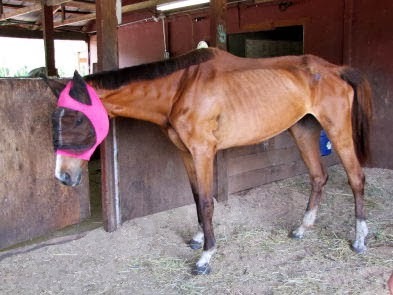 Detectives with sheriff’s agriculture unit verified that an 8-year-old thoroughbred named Jolie was being deprived of proper nourishment, leading to excessive and unnecessary pain and suffering. The horse’s owner, Linda Lee Evans, 51, of the same address, relinquished Jolie and three other horses to Equestrian Rescue. Evans turned herself into the Hillsborough County Jail this afternoon. 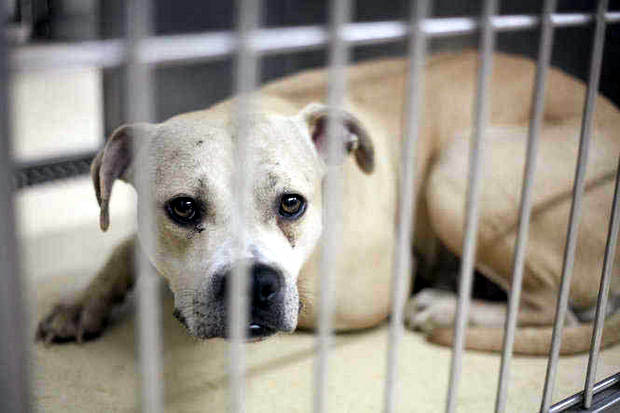 FLORIDA -- Five dogs taken into custody after attacking a 7-year-old girl Tuesday have all been euthanized, Orange County Animal Services confirmed Wednesday. Investigators said the dogs viciously attacked the girl Tuesday evening at a home on 11th Avenue, in the Taft area. She was taken to Arnold Palmer Hospital, but her current condition was not immediately known. 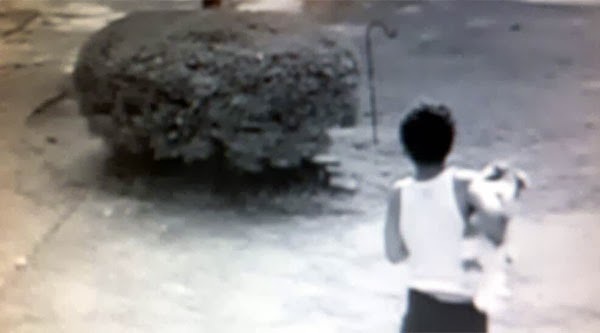 Darryl Lawrence, a neighbor, described the girl's injuries, saying: "She had a three-inch laceration under her arm, a couple real bad bites on her back, and some small bites on her face and on her shoulder." The dogs were taken away by Animal Services trucks Tuesday night. The dogs' owner said all five were black Labrador - Siberian Husky mixes, each weighing at least 85 pounds. Four of the five dogs were 10 months old. The owner had a handwritten "Beware of Dog" sign posted in the yard, where Lawrence said a 4-year-old who lives at the home let the 7-year-old girl in to play, when the dogs attacked her. Neighbors said it took three men to pull the dogs off the little girl. One of the men was also bitten in the leg.